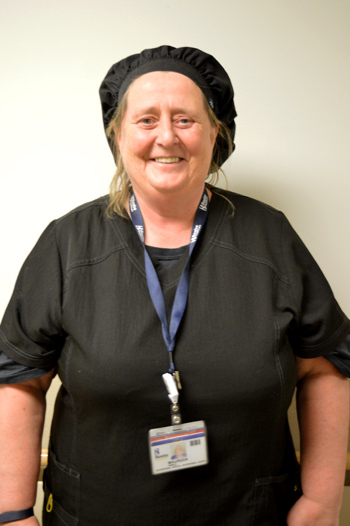 Beebe Healthcare is proud to recognize Maureen Pimble of Beebe’s Nutrition Services team, as the April Living Our Values Every Day (L.O.V.E.) Letter Award recipient. In 2015, a task force of Beebe Healthcare team members met over multiple months to examine exceptional patient experiences and create a system of values, which every team member pledges to follow. Beebe Healthcare team members have pledged to live these values every day. As a patient or visitor at Beebe, you may see these value statements posted. We invite you to help us be mindful of our values as we care for you and your family members. Maureen was nominated by Marcy Jack, Vice President of Quality, Safety, and Risk Management at Beebe Healthcare. Marcy recalled a time when team members were staying late to work on an ongoing project. The employee cafeteria was closed, but Marcy went in to see if anyone remained in the kitchen. Maureen was there. Marcy asked about getting some food for the remaining workers and Maureen immediately jumped into action – making sandwiches and providing snacks for all the team members. Maureen showcased the Beebe values of treating each individual with respect and dignity, building trusting relationships with compassion and kindness, and acting with passion and love for others to make a difference. Thank you, Maureen, for all you do for Beebe! Jeffrey Fried, FACHE, President & CEO; Rick Schaffner, RN, Executive Vice President and Chief Operating Officer, and Kathi Fryling, Director of Support Services, made the presentation and congratulated Maureen. Beebe Healthcare’s L.O.V.E. Letter Recognition Program is similar to an employee of the month program. Team members are encouraged to send L.O.V.E. notes to other team members during the course of the month. A committee then evaluates the L.O.V.E. notes and selects one to receive the monthly L.O.V.E. Letter. Winners are announced in a surprise ceremony in which the committee visits the winner in his or her department and presents the award. For more information about Beebe Healthcare’s values and how team members live our values every day, go to /our-values. For more information about Beebe’s “Celebrate Excellent Care” program and how you can support Beebe Healthcare, the local non-profit community healthcare system, contact the Foundation at (302) 644-2900. Beebe Healthcare is a not-for-profit community healthcare system with a charitable mission to encourage healthy living, prevent illness, and restore optimal health for the people residing, working, or visiting in the communities we serve. It offers services throughout Southern Delaware for residents and visitors, including a 210-licensed-bed hospital, a cancer treatment center, and outpatient facilities providing walk-in care, lab, imaging, and physical rehabilitation services. For more information, please visit us online at www.beebehealthcare.org.